This variation on an old classic is a luxurious cake to serve when you have guests. By utilizing an instant pudding mix, you can change the flavor dramatically. 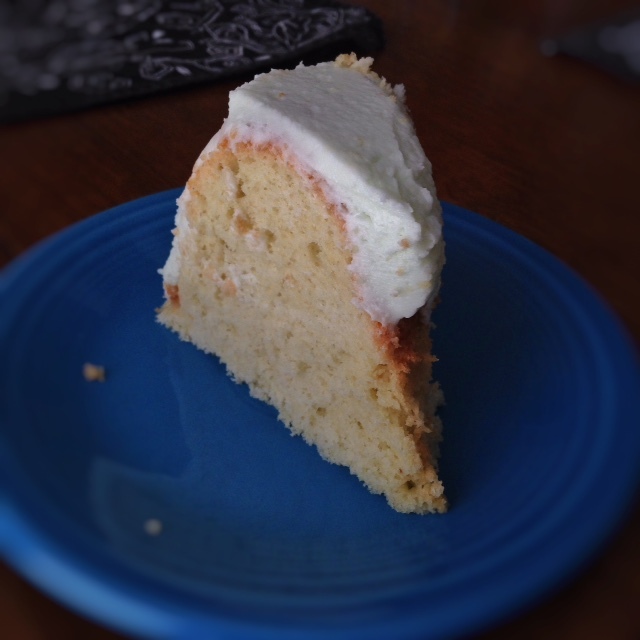 The tall stature and light fluffy texture of this cake is a winner. I even prefer this to angel food cake, as it has a depth in flavor and texture that makes angel food seem almost one dimensional by comparison. My sister in law just returned from France, and as she bit into her second piece of the day, she commented that she forgot she was eating a gluten free cake. The texture will fool anyone. So, if you have a couple hours to spend in the kitchen, and someone to share with, this is worth the effort. Begin by separating the yolks from the whites into 2 bowls. Discard 3 yolks. Mix together the flour, sugar, baking powder and salt into a large bowl (the glass bowl pictured) and make a well in the center. In a measuring cup, mix the 5 tsp of instant pudding mix with 3/4 cup of water. Add to the flour mix. Also add in the egg yolks, vanilla and mix well until smooth (3-4 minutes). Pour into a fluted tube pan or angel food cake pan. I opted for a fluted tube pan, and I had a bit extra that I cooked in a separate glass dish. You can cut through the batter in a figure eight motion to eliminate air bubbles (this is done with a knife). Fill LESS full than I did. You can see I filled mine to the brim, and the result was that it spilled over just a bit in baking. Fill 1/2 -1 inch under that line so there is room to grow. Bake at 325 degrees F for aprox 70 minutes. (check at 60). Cake is done when it springs back to touch and turns golden across the top. Flip upside down to cool (I used a bottle to hold the pan upside down). Cool completely before removing from pan. To remove, take a butter knife and loosen the cake around the sides, then tap from the upside down position until cake falls out onto your platter. Once the cake has cooled, I trim the fluffy over growth from the pan (the bottom, so to speak) and put that in a separate container to snack on later. The cake remains to be frosted. You can use a simple sugar icing, a whipped cream, or other. I opted for a basic shortening and powdered sugar frosting, but I added 5 tsp of instant pistachio pudding mix to 4 Tablespoons of almond milk and mixed that into the frosting blend. This enhances the mild pistachio flavor. While this is more time consuming and less healthy than my average dessert, it is a wonderful cake for special occasions and for specialty flavor requests.